Discussion in 'XJ Technical Chat' started by Chorca, Jun 11, 2009. We have the correct seal for your bike in stock, have sold hundreds of them, never had a leak reported. Again, look at the little "teeth" or lips on the inside diameter........those lips should point "down" when installed in the correct orientation, so they can "scrape" the oil off of the inner tube as it moves up and out of the lower tube. OK I'm back with bad news. I spened half of the day replacing the selas again and guess what? they leak again. The only good think is that I took a long ride to get rid of the frustration. Any way I think I will buy the new selas form chacal. This Company Markets LEAK PROOF Seals. They guarantee their Seals Not to Leak ... for LIFE!!! I see a Marriage made in Heaven!!! Once this valve is back on the fork, where to you locate/orient it before adding air pressure? (the 0-17psi) Pics? The Top of the Fork Tune will be flush with the Top of the Steering Brace. The Wive Clip will position the Pneumatic Collar from being misplaced. The Wire Clip goes on first' The Air Collar comes to rest on the Wire Clip. Lube the Top of the Fork Tube with Fork Oil or Brake Fluid. Lube the Rubber Air Seals within the Collar. Slide the Collar onto the Fork and the Air Hole in the Fork Tube will be centered between the Rubber Seals. Thanks for the description Rick, and that is where I reinstalled it. I'm assuming orientation of the collar itself doesn't matter. I guess I don't see how it adjusts the pressure inside the fork here...is there a pin-sized hole that it covers in that position that I didn't see, that lets the pressure get into the fork tube? Um....shouldn't this read "fits between the top of the air collar and the bottom of the UPPER steering bracket" ? That's how mine is anyway. Um....shouldn't this read "fits between the top of the air collar and the bottom of the UPPER steering bracket"
Skills, you are so right, you are today's Grand Prize Winner! Yay! Now, does that come with my next order will it be a separate shipment? Ah crap. Doing these seals again because my tubes were too pitted and ruined my new seals. Also to replace the springs. I've almost gotten one done, but I can't get the dampening rod bolt to tighten. It's just spinning, and these are the 750 seca forks that don't have the fluting for the dampening rod hold down tool. Any ideas on how I can tighten this down or did I miss something? Can I final tighten the bolt when everything is reassembled on the bike, forks loaded down? Nope, gotta tighten the correct way: remove the anti-dive assembly, and take a look in the bottom hole. You need to ensure that the middle hole of the three holes on the bottom of the valve (inside the fork) is lined up with the bottom hole for the AD. 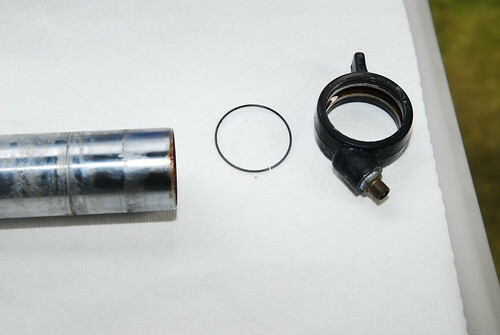 Use a round punch or equivalent to hold the valve in place while tightening the bolt. IIRC, it only needs maybe 10 ft-lbs. 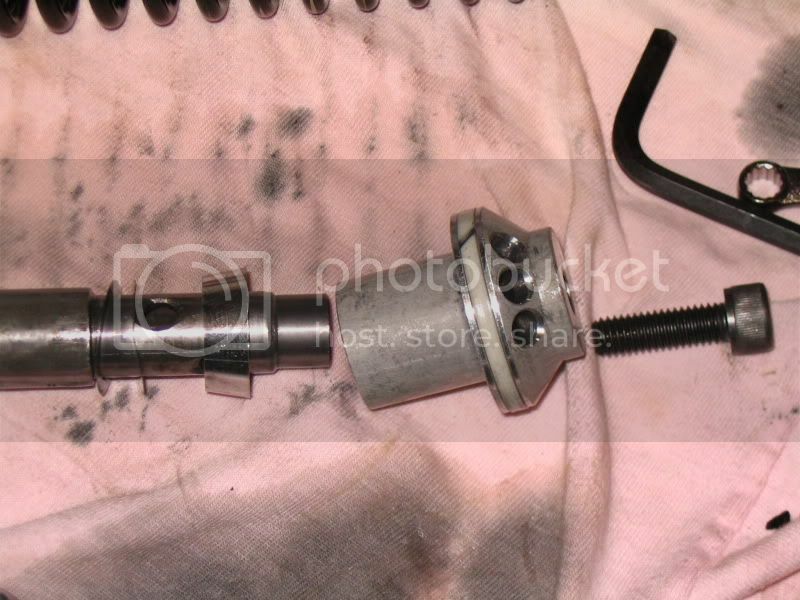 well my problem seems to be that I can hold the lower part of the oil control valve assembly with an allen wrench as you describe, but I can see the actual damper rod turning. And I have the parts assembled in the same order you do skillz. Ok, put the spring etc in and install the cap. the spring will hold the damper rod. Then you can just pull the cap and finish up anything else you need to do. You could also just wait until it's on the bike, but you have to tighten the bolt before putting the oil in or it'll leak right out the bottom. wrap the tube in a rag and clamp it in your vice. Use a wooden dowel to push down on the cap (under my chin is how I did it). Then you have both hands free, use a mechanics pick to pluck the circlip out. 15 seconds tops. 3. put the spring in and the cap. 4. turn fork assembly upside down and put a socket extension in the axle hole. 5. put all your weight on the fork as a buddy tightens the bolt to the appropriate torque. 6. take the cap and spring out, and continue as described in this thread. Again, I don't know why my damper rod wouldn't hold itself in place in only one fork. And it will probably take you a couple of days less time without all the cursing/trying the same thing :roll: . And me and buddy got really good at taking off that cap.